One in four of us will have problems with our mental health and wellbeing at some time in our lives, with about two in every thousand needing specialist care for serious conditions like severe anxiety or depression. The NHS provides specialist mental health services throughout the UK for those who need it, in the form of day care, inpatient services and services in the community. Today, there is a more innovative approach to mental health rehabilitation, with a range of therapeutic activities on offer. Patients using the rehabilitation services at Mandalay House in Aylesbury now have an exciting new outdoor space to use, thanks to a £35,000 project to improve their environment. The Oxfordshire & Buckinghamshire Mental Health Partnership NHS Trust was awarded the money by the King’s Fund as part of its ‘Enhancing the Healing Environment’ programme. The team at Mandalay House identified that a covered, see-through structure in the garden would provide much needed additional social, recreational and therapeutic space, with the added bonus that it could be used all year round. 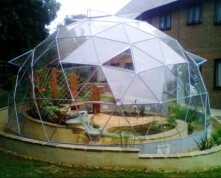 The design for the outdoor structure, provided by geodesic dome specialists Solardome Industries, was produced in consultation with patients and includes a moving water feature to create a relaxing environment, options for lighting, the provision of seating areas and low upkeep planting which patients can help to maintain. Solardome® glasshouses create an inviting, tranquil, ‘back to nature’ environment which, in turn, stimulates a feeling of wellbeing. This makes them appealing to the health sector, particularly from a mental health perspective, because they address the need for an innovative approach to rehabilitation and therapeutic activities. 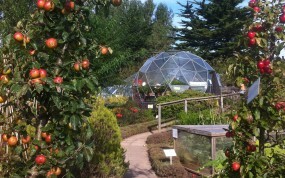 The unique shape of the dome provides an engaging space to exhibit as well as creating a more efficient environment for growing plants than a traditional greenhouse.